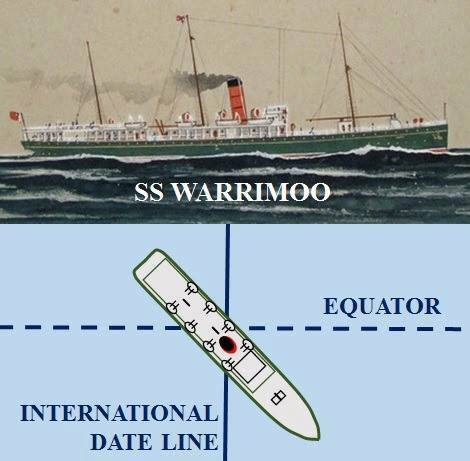 The passenger steamer SS Warrimoo was quietly knifing its way through the waters of the mid-Pacific on its way from Vancouver to Australia. The navigator had just finished working out a star fix and brought the master, Captain John Phillips, the result. The Warrimoo’s position was latitude 0 degrees x 31 minutes north and longitude 179 degrees x 30 minutes west. The date was 30 December 1899. Know what this means? First Mate Payton broke in, we’re only a few miles from the intersection of the Equator and the International Date Line. This ship was therefore not only in two different days, two different months, two different seasons and two different years but in two different centuries-all at the same time.